and all types of machined parts. We have over 25 years’ experience. Our professional team is our best asset. All its members provide high levels of efficiency in every single project we develop. Our organisational structure enables us to optimise the achievement of the company’s planned objectives. Aside from our main lines of service, we offer a number of other services to our clients based on our experience. We have the right technology to carry out all types of jobs in each one of our lines of business. 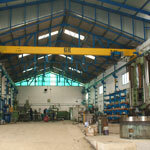 Many years of experience and a highly-qualified team allocated to each of the jobs we carry out allow us the accomplishment of projects covering the entire process, from the manufacturing to the assembly and maintenance stages, providing the client with a turnkey project which translates into peace of mind. We dedicate an 800 m2 warehouse to overhead cranes of 3.2 and 6.3 tonnes, as well as specialist systems to cover all our clients’ needs. 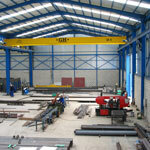 In order to manufacture the largest metal fabrication parts we have two warehouses: one with an area of 2,000 m2 and another one with over 800 m2, equipped with all types of equipment and 6 overhead cranes of up to 10 tonnes. 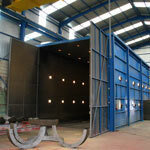 For the abrasive blasting and painting service, Mecavi dedicates a warehouse of 560 m2, with one 10/5 tonne overhead crane and a 16x6x6 m blasting cabin.